This collection of worksheets is designed exclusively for students of Grade 5. 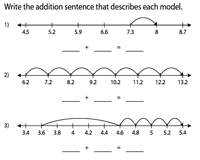 Learn to use number lines to sum up decimals with two or three addends. Worksheets are categorized into place values of tenths, hundredths and thousandths for convenient downloads. 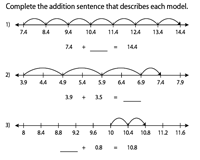 Observe each number line and complete the addition sentences containing decimals. The worksheets are segregated according to place values up to thousandths along with a section that contains a mixed review. 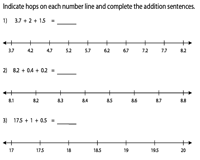 Indicate hops on the number line to complete the decimal addition sentence. 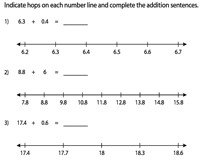 Longer hops drawn will denote the whole number part and the smaller hops will indicate the decimal part. Read the number line. Fill in the missing decimals in each addition sentence based on the intervals observed. Answer keys are included. The start and the endpoints of the number line represents the first addend and the sum respectively. Observe the intervals to find the second addend. Then, frame the addition sentences. 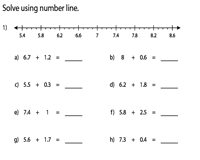 The ruler model is followed in this batch of number line worksheets. Observe the big and small hops indicated and frame the addition sentences. 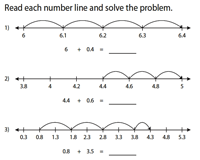 Use the number lines provided to solve each problem displayed in both vertical and horizontal formats. 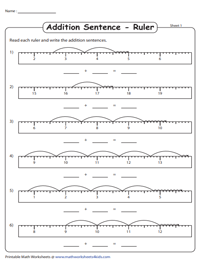 This series of worksheets is split in accordance to place values up to thousandths. Indicate hops to show the sum of three decimals. Then, complete the addition sentence. Print these worksheets for an in-class assignment. 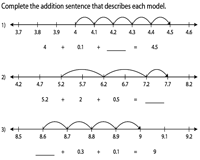 Observe the number line and complete the addition sentence. The problems are based on decimal addition involving three addends. Members, Please LOG IN to download. Members have exclusive facilities to download an individual worksheet, an entire level or the complete lesson. Not a Member? Please SIGN UP to gain complete access.